Synopsis (via Goodreads): Everyone in the Underland has been taking great pains to keep The Prophecy of Time from Gregor. Gregor knows it must say something awful but he never imagined just how awful: It calls for the warrior's death. Now, with an army of rats approaching, and his mom and sister still in Regalia, Gregor the warrior must gather up his courage to help defend Regalia and get his family home safely. The entire existence of the Underland is in Gregor's hands, and time is running out. There is a code to be cracked, a mysterious new princess, Gregor's burgeoning dark side, and a war to end all wars. Warning! Possible spoilers for the previous books in the series. 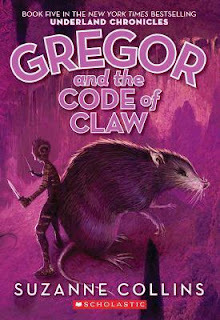 Gregor and the Code of Claw wasn't what I was expecting. I've been reading this series to my kids (usually at night before bedtime), but the books became increasingly violent as the story progressed. I had to skim over a few of the battles and deaths so my children wouldn't have nightmares. They're old enough to enjoy chapter books being read to them, but not quite old enough to understand senseless killing and the intricacies of war. Also, terrible things happen to some of our favorite characters, and I had a hard time explaining why I was crying uncontrollably. Suzanne Collins has a knack for making you fall in love with characters and then killing them when you least expect it. She did the same thing with The Hunger Games series. I still haven't forgiven her for the that, and I'm definitely not going to forgive her for this. At times it was easy to forget that Gregor was just an eleven or twelve-year old boy. He always seemed much older in conversations, and in the way he handled himself during battles. I know he's a Rager, but he still showed a lot of maturity for his age. Luxa and Howard, too. He showed compassion for the other species living in the Underland, even when everyone else belittled the Nibblers or ridiculed the Crawlers.. He saw something worth saving in every creature, and not just those that called themselves allies. Every life had value to Gregor, and it was a lesson a lot of Underlanders needed to learn. I know I've mentioned this before, but Collins made me love cockroaches. That doesn't mean I'm going to avoid smushing them, because they're definitely getting smushed, but now I'll hesitate for a millisecond beforehand. Boots was adorable, and I really enjoyed her relationship with the Crawlers. She even learns how to communicate with them! She and Hazard were awesome characters, and really acted their ages. Ares is the best bat ever! I loved him and his relationship with Gregor. They both feel like outcasts, even though they have two of the biggest hearts in the Underland. They're willing to sacrifice themselves (repeatedly) to save the lives of others, but remain underappreciated. I really wish it had been possible for Ares to live aboveground with Gregor and his family, but giant bats might cause a panic. However, it was New York, so they may have been okay. Ripred and Lizzie's relationship also pulled at my heartstrings. Ripred's history doesn't really come up until this last book, but I feel like I understand him more now. He has a reason for everything he does, and his crazy idea about the prophecies made me rethink everything I thought I knew. I've always thought this series had a little magical realism, but now I'm not so sure. Every book we lost friends and allies, but Gregor and the Code of Claw really impacted me emotionally. 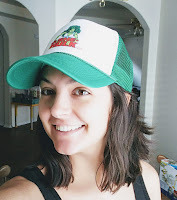 After five books, I started to care deeply about the characters, and they felt very real to me. It was hard to lose some of them. Honestly, the book before this one was difficult as well. Hundreds died, including babies, and it made me ill. Suzanne Collins is a phenomenal writer, and really packs a punch with her stories. They make you think about the world, even though the one she is writing about is completely fictional. So fun when a book set for younger people can capture the love of all ages. Wonderful review! So glad you liked it!! I made my brother read the series after I did (he's a few years older than me) back when we were younger, and he cried just as hard as me! Hm... I'm going to have to check these out. I will have to see if it changes my mind about cockroaches. LOL Brilly review.